« The Ideal David Bowie Song? Way back in 1972 when David Bowie developed the character of Ziggy Stardust and his band the Spiders From Mars, never in his most coked-out dreams did he think he would ever have an actual arachnid named after that endeavor. German scientist and spider expert Peter Jäger discovered the spider Heteropoda davidbowie on Mars in Malaysia earlier this year. Jäger has said in interviews since the discovery that he finds that naming spiders after celebrities brings more attention to the endangered status of these insects as their habitats are destroyed. With this publicity stunt, the Heteropoda davidbowie joins Myrmekiaphila neilyoungi in the ranks of spiders named after musicians. This entry was posted on Wednesday, September 9th, 2009 at 11:21 am	and is filed under Circle Of Friends, News. You can follow any responses to this entry through the RSS 2.0 feed. Both comments and pings are currently closed. 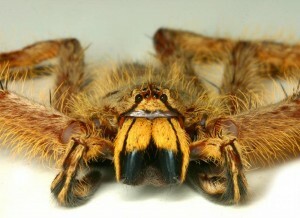 Apparently this guy has named spiders after Neil Young (a hairy, slightly creepy one) and Stephen Colbert (the one with eight right legs) as well. I suppose I shouldn’t presume to second-guess Mr. Bowie’s career goals, but “I want to become world famous so some geezer will name a spider after me” might not have occurred to him. It is, however, a form of real immortality if you’re into science. Stephen Jay Gould writes with surprising emotion about it. A spider named after Stephen Colbert? I guess Jäger really knows how to get attention from a powerful fanbase. When the Colbert Nation is galvanized for a cause, they can move mountains. Space stations, even…..